To you, Lord, belong greatness and power, honor, splendor, and majesty, because everything in heaven and on earth belongs to you. Yours, Lord, is the kingship, and you are honored as head of all. 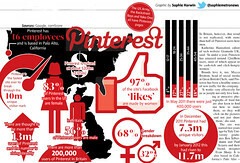 Social media enthusiasts are enamored with the momentum of Pinterest. The number of men jumping on ‘boards’ is growing. Brand marketers are quickly and strategically infiltrating this network wherever they can. Big brands, intent on converting images into new revenue and profits streams, populate the daily flow of images. Meanwhile, for those of us on the lookout for every opportunity to #LiveSticky, Pinterest is yet another place to share and live out our faith. On this platform every board holds the possibility of becoming a glorious reflection the God we serve. Captivating images create conversations and conversations birth more shared experiences. Community happens, relationships form, inspiration abounds, and with a dose of intentionality, Pinterest creations introduce others to the One true Creator. Spirit-filled faith cannot be contained. It seeks to flow directly from our lives into the lives of others. On this rapidly growing social media platform, the current is strong. The command has been given. There’s much work to do and it’s time for you, beloved digital disciple to GO. Don’t keep this lost and dying world waiting another moment longer. Pray – Pray – Pray – Submit your heart, time, and online conversation to the Lord. Allow Him to power you up before you power on each day. Focus on the agenda – Stay on mission. Know why you are there and Who you serve. Listen carefully – There’s a lot of chatter, but among it are real people in real need of the Truth that can save them. Understand there’s a person behind every post –Hurt people hurt. It’s no different online. Don’t judge or discriminate. Ask your Father to see the person behind the post through His eyes. May I be pleasing in Your sight. One evening while trying to get my mind around how Google + fit into my social media routine, I found myself in pause mode. An intense conversation between a small group of men caught my attention. Dialog bounced back and forth like a Michigan hockey puck. Each person took his shot at vehemently recanting all the things he hated about Facebook. For me, hate is a strong word, but I found myself stuck there, nonetheless, listening.